You may have heard the term 'Science 2.0' and wondered if it is just jargon, like Web 2.0. It's more precise than that because we missed the fad aspects of web development, and when we first came up with it and set out to create a Science 2.0 network, the term Science 2.0® had so little name recognition virtually no one else here wanted to use it. 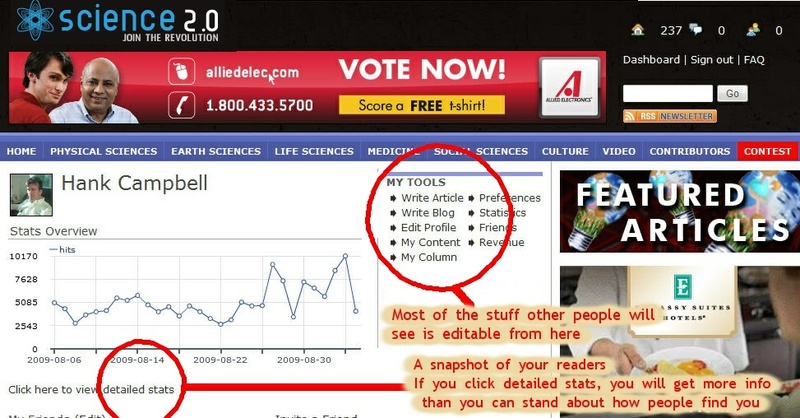 But then we got popular and the term began to catch on and you have seen Science 2.0 mentioned in Science and Scientific American and many other places, each with their own take on what it is, but Science 2.0 as I originally envisioned encompassed collaboration, communication, participation and publication. All of those words end in '-ion' so when we formed a group to help take science into the next century, in 2006, we named it ION. Motivation, dedication and perspiration end that way as well, thus it has continued to make sense. 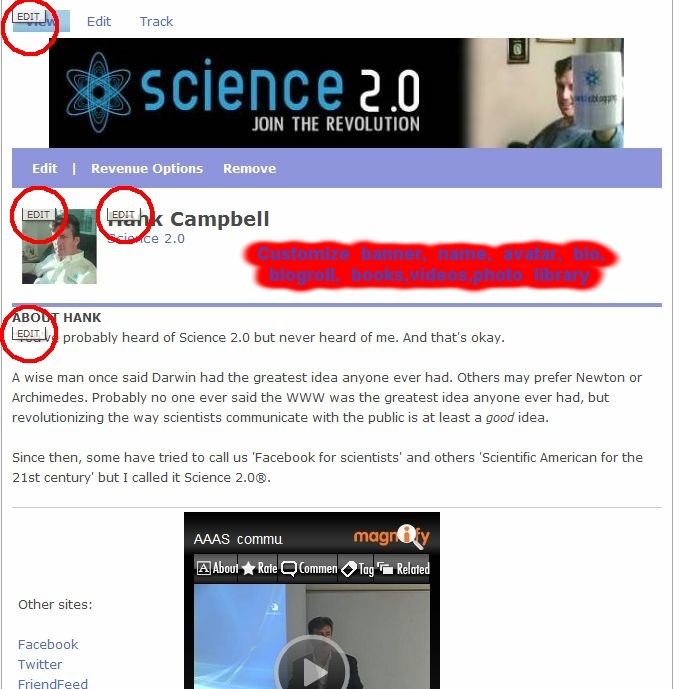 Why the annoying Science 2.0® thing? Because not all people are honest. Everyone from those trying to create television shows to universities in Germany exploiting people with conferences has tried to make money off of Science 2.0's goodwill. Though Science 2.0 is not a media corporation, it has corporate competitors on one side and then unethical schools in Russian and Germany on the other, so making it a registered trademark was necessary because after this became successful, everyone claimed to have invented it. The National Science Foundation even gave a school $500,000 in 2010 to create a Science 2.0, so even the U.S. government will ignore its own Patent and Trademark laws if they can get away with it. People are free to use the name as long as they do not charge or monetize it, as has always been the case. Science 2.0® is not anything people want it to be. If that were the case, I would just have called it Smurf. It is not some esoteric networking theory, nor is it European angst about the failure of scientists to give away all their work for free (yes, those are real efforts to redefine Science 2.0). It is a framework to modernize the science endeavor, including tools, publishing and collaboration as noted in the Four Pillars of Science 2.0 above. To new people, looking from outside, this part of Science 2.0 is like a magazine where scientists can sign up and write. It's the only large, open science community but that does not mean just anyone has a right to foist off a PDF of mathematics gobbledygook inventing time travel, take uneducated shots at physics or biology or promote crackpot ideas about autism. Generally, you can't be here if you want to exploit scientists to try and validate crank ideas. So please keep in mind that the science world does not have to endure uninformed nonsense and 'you are not scientists if you don't treat me like an equal' rationales will not work. I mentioned Web 2.0 in the first paragraph for a reason. I heard the term "Web 2.0" in 2004 thanks to Tim O'Reilly and, while I had been thinking of the concepts behind Science 2.0 for a while, and discussed it on a long-gone Blogspot site, it didn't have a formal name. But that 2.0 thing stuck with me. Being in the physics/engineering analysis software world for a dozen years at the point, I knew a lot of PhDs. They worked in our R&D groups and, for a time, I managed the university program at a company called Ansoft Corporation. At Ansoft I got to know a lot of academics who were trying to solve electromagnetic problems. Knowing both academics and corporate researchers I found two things in common; they thought media coverage of their field was not very good but also that the corporate media system blocked out detailed discussions that gave the broad audience credit for being smarter than the average 14-year-old. In the age of the Internet, there was no longer a reason for an artificial barrier. But it was not a trivial undertaking to undo a hundred-plus years of entrenched culture and that meant spending a lot of time at it. By the end of 2005 I knew I was going to have the time and the money to pursue Science 2.0 but my time and money were not unlimited. So rather than try and remake publishing and collaboration and public participation all at once, and succeed at none, the first effort was communication - basically because that was the easiest given the tools available. I began building this and, in my naiveté, I wrote and called up world-class people in science to ask if they would participate in something they had not even seen. For free. Science academics, bless 'em, did it. Since this was a collaboration and I was the outsider, I couldn't be autocratic so I put the name of the communication site up for a vote. Literally no one else liked the name Science 2.0. It made no sense, they said, and when I explained it they said Science 2.0 should be for a collaboration tool instead. They liked Scientific Blogging so ScientificBlogging.com became the name of the first pillar of the Science 2.0 concept and Science 2.0 stayed reserved for collaboration. The Scientific Blogging name always bugged me, though. Until 2008 we didn't even do any blogging and even today blogging is only 4% of the content here. Given that name, I had envisioned 10,000 science grad students blogging but instead we had serious people writing feature articles and so in 2009 we took the Internet search engine hit and changed the URL to Science 2.0. What about that collaboration tool? In getting to know people in research there isn't much demand for it. Everyone says there is demand for it but, in business, we know everyone wants a product that is fast, accurate and cheap - but they will pay for something that has 2 out of those 3. A collaboration tools would need to be 3 out of 3, and cheap means 'free' and what I envision will cost a lot of money - millions and millions of dollars - and it's hard to give something away for free when the outlay is huge and the market small. It's in the roadmap for the future but that will be after Science 2.0 is paying for itself due to other efforts, like Communication and Publication. 1. Why does this site exist? - Science has done amazing things throughout human history and with the advent of new technologies science now has the opportunity to dramatically improve communication, collaboration, publication and participation. While we globally called it Science 2.0®, this particular site was designed to enhance the communication and participation aspects. Here, world-class scientists, graduate students, undergrads and educated people outside science write articles and discuss issues without being filtered by size or editorial limitations. We can read great science directly from smart people and maybe learn some new things. Obviously, there are numerous places where scientists can write but individual scientists are lost in a sea of hundreds of million sites, blogs, tweets and everything else. The audience is here to discuss science and we have millions of articles read per month so the audience is already built in. You can just write good articles and have fun. We carry an ad to defray costs but we stay as financially transparent as possible by paying the bulk of the revenue generated by scientists doing the work to the scientists. We do keep a little bit to pay for the servers. If you don't want any money, tell us and we will disable the ads on your work. Since this is the Science 2.0 community, you help shape the culture also. We have incorporated virtually everything in social media we could find to enhance the discussion worldwide using the best available tools. 2. Who can write here? - Many of the writers are prominent book authors, research professors and post-docs but journalists and science bloggers can also write here. It doesn't mean that if you sign up, you will, if you are not an established writer or researcher. We have a giant audience with limited time and they want to know this is not a free-for-all so if you are not an established scientist or science journalist/blogger you can only initially write on your corkboard. If that's unacceptable and you think our million readers a month should be available to you right away, you are probably better off starting your own site on Blogspot.com If you are a researcher or journalist, the only restrictions are: there are no anonymous accounts, we use real names; you have to (mostly) write about science; and you can't post things that are just self-promotion, advertising or teasers to articles on another site - they'll be removed and your account deleted. We don't get into defining what is science and what isn't science, it's self-evident to you in most cases if you got the ability to write here. Poems about your cat, for example, are not science, nor are claims that you have overturned all of physics, invented free energy, created time travel, etc. Everyone has freedom of expression on the Internet, but you have to make your own site for unlimited freedom; among a membership community of scientists there are limits. 3. How do new people get attention? 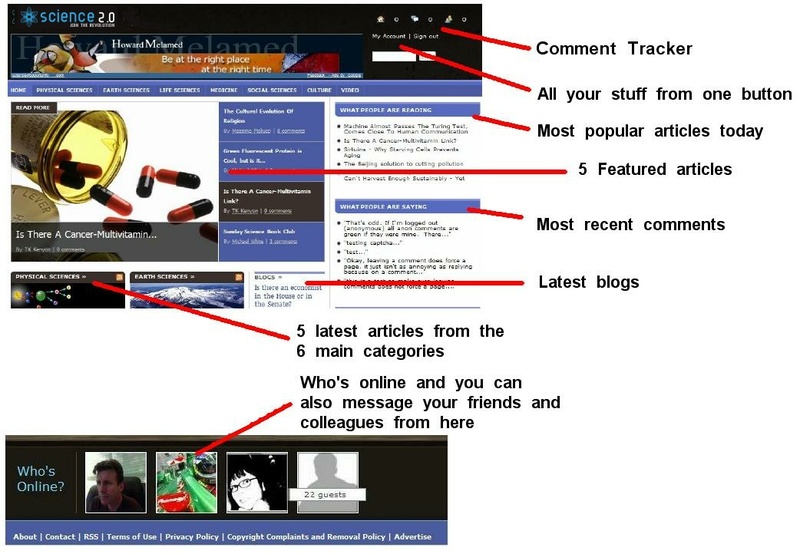 If the blogging or columnist switch is enabled for your account (and it won't be if you are not a scientist and sign up, your account is instead 'sandboxed' to make sure you are not here to promote your personal Theory Of Everything) each new piece will appear on the front page for a short while. It will also appear on the Science Category pages. Well-written pieces become popular and they will remain in the front of the main page or category pages. Just write good content and people will start reading you - the audience is very smart. Like anything else, it requires patience and persistence. The easiest way to get discovered is to join discussions on other articles here or in other places where you can leave a URL link to your column. We also have submissions buttons to all the other social media sites on each published piece so readers can spread the word for you - and you can do it also. Here are some guidelines created by the community moderators for this site. 1. Spam and off-topic posts: These are posts that are advertisements for products, or just teaser links to your own off-site blog, or posts not even remotely related to science. Philosophy of mind/knowledge, science fiction, etc., are fine. A. Classic pseudoscience - creationism/intelligent design, violations of the first law of thermodynamics, homeopathy and other 'alternative' medicine treatments that are based on ideas that go against major long- and well-established principles of multiple scientific fields. B. Baseless speculative nonsense - claims, made without supporting evidence by people with no research training or track record in the relevant field, that suggest that major, fundamental knowledge of biology, chemistry, and/or physics is wrong. Authors also have moderation ability over the comments in their columns so that might be considered censorship but we recognize that spam and trolling occur and allow authors to prevent that. 5. Do I retain my copyright? - Yes, you grant us rights regarding publication but you own your work unless through prior agreement with us - like if we paid you to write an article. There are two sections in Science 2.0: The front pages and their contents are created by researchers, book authors, journalists and contributors who are well-established but many were not well-known when they started. 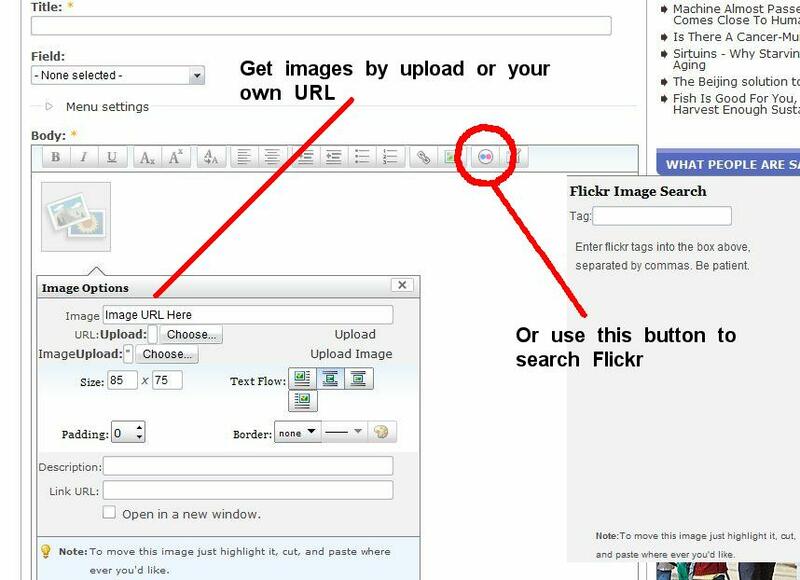 To get known, you have a Corkboard on your Profile and everyone who has an account can create content in the Science 2.0 Forum (within reason: see The Details of Science 2.0 below). So this section is just to familiarize you with the layout of the site. Boring stuff about history is way down at the bottom. From the front page, you can navigate around and read everything you might like but if you want to jump in and sharing, you need to go to your Dashboard. It's in the upper right, always there when you need it but otherwise not getting in the way. The two graphics below show the layout of the front page and header and also the footer. A lot of the more subtle features are covered in the advanced section but for now you can go to your dashboard and do most anything you want. At first you can only share links via your corkboard but over time you will get a Write Blog function. Article creation is quite easy. Go to Dashboard by clicking it in the upper right and then click Write Blog. After you have been around a while you will also have an option to Write Article and have Featured articles that are syndicated in a variety of places. You can also customize your column from Dashboard. The toolbar is what you expect in any modern word processor. If you prefer to do your own HTML by hand, click "SWITCH TO PLAIN EDITOR" below the text entry box. If you do a bunch of fancy stuff in a proprietary editor like Word, it will not go directly into our editor and you have to click SWITCH TO PLAIN EDITOR first. Microsoft does not play nicely with anyone else's tools so if you just copy and paste Word HTML into our editor it will look terrible. For that, we have a Corkboard feature. If you've ever seen Facebook or Twitter, they do the same thing. 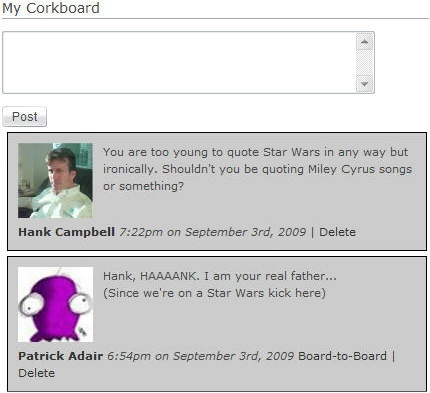 A 'cork' is a short blurb or a link to something you want to share, but only your mutual friends can see it (so someone can add you to their friend list to know when you write new stuff but they can't see your corkboard unless you add them) - this is for things you want to share and talk about, but not with the entire world. Corks do not show up in google or your newsfeed but you will get email notification (if you have it enabled in Preferences) when someone writes on your Corkboard and they will show in your comment tracker in the upper right. Because we're not just a site that talks at people and maybe lets them comment. We all interact too. Science 2.0 is about taking the Web back from people who want to lecture at others (or just sell dog food). We're not just a magazine or a blogging site, we're also a community. If you came here from outside you saw some articles and comments and not much else. Under the hood it's a lot more fun. It's a lot more fun writing if people know who you are. Sure, you can throw an article up there and assume it will take off but you could be on Wordpress if that's your thing. If you're interested in science outreach, people have to know you are here. The easiest way to look like a real person is to create a profile that's worth reading. The profile is what people will see when they click your avatar. Farther down the page you will also see a Blogroll, Recommended Books, and Affiliations. Those work the same way; click Edit, add what you want, and you are done. That covers how people will find you. You find them by either reading the front page or reading the comments, clicking on their profile and then adding them to your friend list. You can also email them through the site. Note; non-members can email you through the site as well. If you do not want to get emails from anyone, disable it in your Dashboard Preferences. You can also find new friends (and see who else is online at the moment) by looking at the avatars in the footer. You can use the little arrow on the side to scroll over to the next page of avatars. You see some of the avatars are highlighted in green. That means they are on my friend list. Your friends will also show up first on the left and then everyone else. If I am also on their friend list, it means we can also chat and you will see a 'MESSAGE' button appear if you highlight their avatar. See what I mean about hidden features? We're one big Science 2.0 onion of delightful complexity. "Science 2.0"®,"Scientific Blogging"® and "The world's best scientists, the Internet's smartest readers"® are registered trademarks of ION Publications LLC. Copyright © 2006-2015 ION Publications LLC. All rights reserved.